Did you know that Hyundai has its own national 501(c)(3) organization to support children with pediatric cancer? The non-profit effort is recognized for its hand print ceremonies, in which young ones undergoing treatment or recovering dip their hand in paint and leave their mark on a Hyundai vehicle. Did you also know that at over 800 Hyundai dealerships, a portion of each new vehicle sold goes to Hyundai Hope on Wheels? To raise awareness of this awesome partnership, Hyundai has added a new viewing option on its USA website: a rainbow of hand prints. Originally begun as a partnership between New England Hyundai dealerships to support a local cancer institute (learn the organization’s history), Hyundai Hope on Wheels has raised tens of millions of dollars over the past 20 years to support the fight against pediatric cancer. 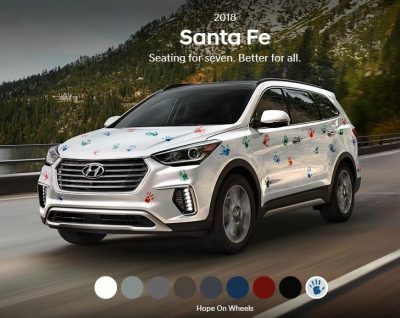 For a limited time, Hyundai’s 2018 models can be viewed in a special Hope on Wheels body color design: a white exterior paint with the replica red, green, and blue-colored hand prints of children. This website Easter egg can be found on the pages for the Santa Fe, Elantra, Elantra GT, and soon other models. 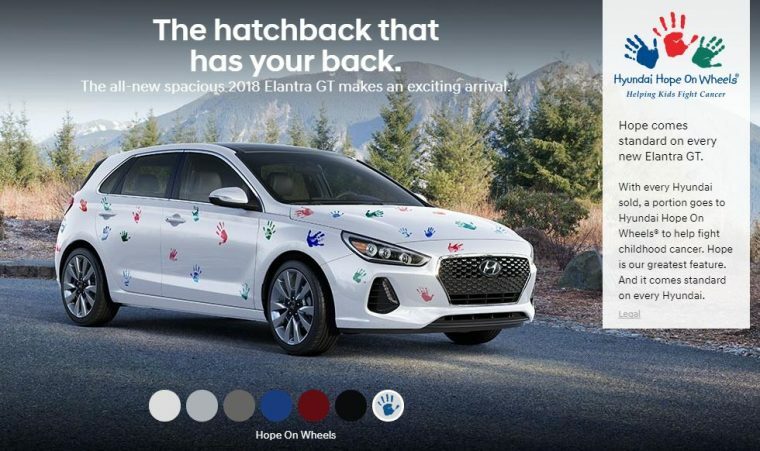 While your personal 2018 Hyundai cannot be currently ordered with this body design through HyundaiUSA.com’s configurator, you can still see your favorite Hyundai model outfitted with the automaker’s meaningful reminder of the charity work it’s doing.